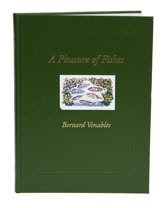 Bernard was many things, but this book is the result of the rare ability of being able to publish after his death (Zane Grey did it too) and A Pleasure of Fishes is doubly special because he started work on it fifty years ago. The book was the result of a chance conversation with Sir Allen Lane and is a large format volume based around the author’s paintings of twenty-eight different fish, ranging from crucian carp to ruffe. Each chapter is focussed on a single species, with several pages of text written in Bernard’s inimitable style accompanying one or more of his paintings; all of which are beautifully reproduced at the largest possible size and do complete justice to the vibrant colours of the originals. A unique work that will please Bernard’s fans everywhere.